I was not one of those stamp collector kids that inherit the hobby from their grandparents. 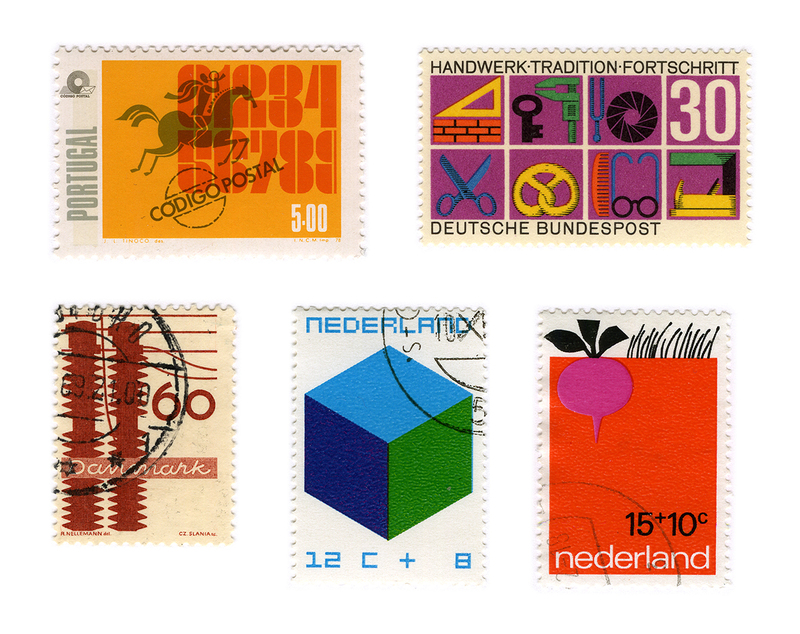 I started collecting stamps (as well as riding a bike) while studying Graphic Design in Portugal. Where I grew up there weren’t a lot of antiques fairs, at least I don’t recall going to any. While studying at University in Caldas da Rainha there was an antiques fair at the city park every second Sunday of the month, and it was there I came across this affordable hobby. Some of the first stamps I bought. 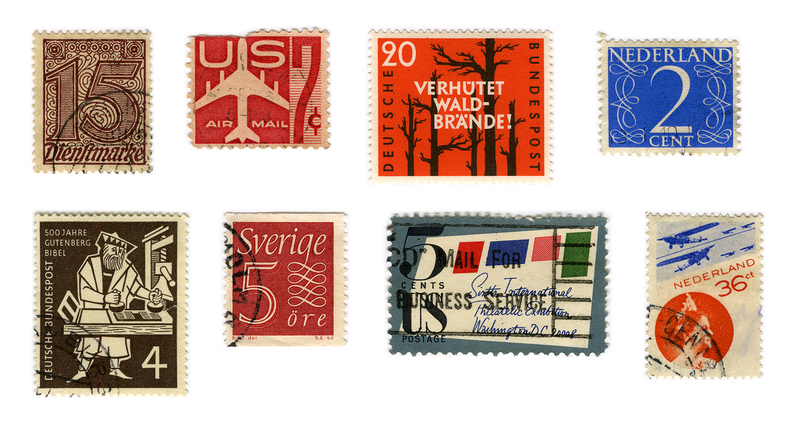 I bought stamps from a man that would sell them at 13 cents each — the more you’d get, the cheaper they were. I had no knowledge of stamp values, so I would just browse his stamps and pick them based on what I thought was beautiful, interesting, or sometimes funny or dumb. Initially, I had no specific boundaries or a set goal. I didn’t know that there are people who collect stamps following a system — only cars, flowers, mushrooms or just by country. I just collected everything I liked. As my collection grew, I started to organize them by country since my subjects were so broad; this was the easiest way to keep them in order somehow. As with everything you collect, with time you start to find out more about the subject. I remember the first time I came across the website of Kat Ran Press, and how I felt somewhat proud that I had so many “designer stamps”. I hadn’t bought them because they were from famous designers, I had bought them because I thought they were cool. 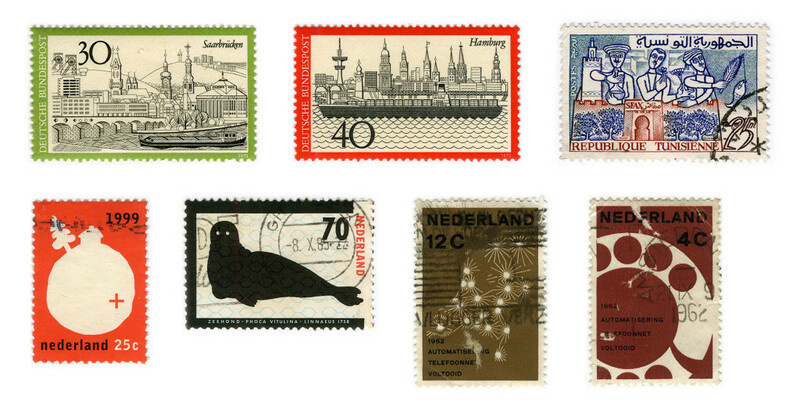 From left to right stamps by: Unknown (2), Kern, Jan van Krimpen, Walter Brudi, Karl-Erik Forsberg, Thomas F. Naegele and Piet Zwart. Of course with time (and knowledge) I bought more stamps from designers I admire, which I first have seen featured on the Kat Ran Press website. As you can see, my stamp collection is all over the place and not always in the best condition, but I am very happy with it, it is my own. I love my stamp collection! 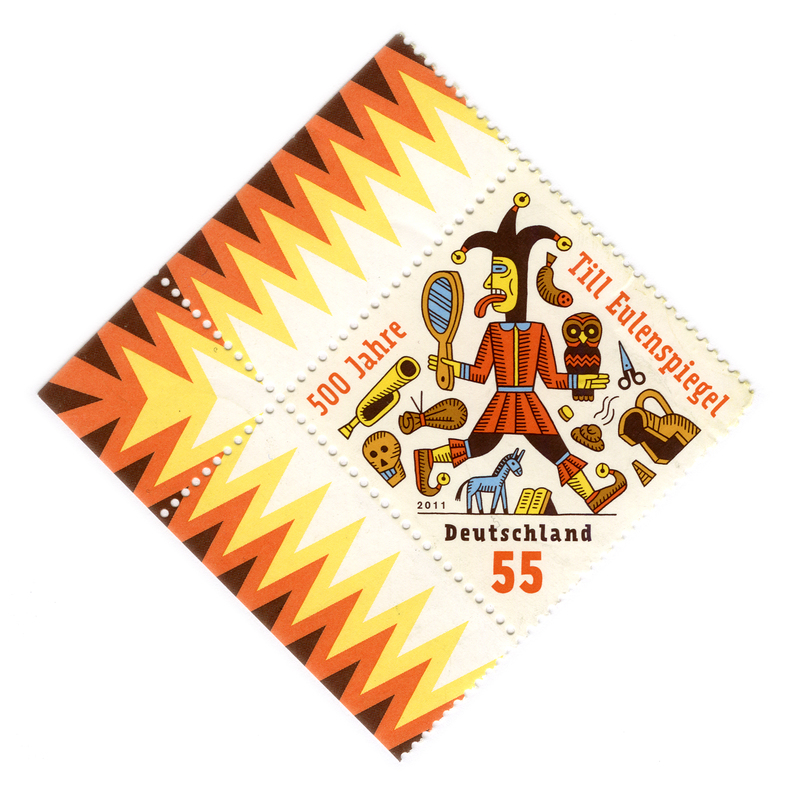 However, I am always happy when countries like Germany and the Netherlands, known for their awesome stamp design tradition, still keep up their reputation and release good contemporary stamps. If you like stamps too, I highly recommend following the Instagram accounts of @graphilately, @katranpress, @linns_stamp_news and @mintneverhinged. Share your love for letters with us on Instagram or tweet at us @alphabettes_org with the hashtag #letterlove.